27 December: "Boy Scout collects donations for Soldiers, Marines for Eagle Scout Project"
25 December: "Fallen soldier's words deliver a enduring message"
24 December: "Boosters play Santa to soldiers overseas"
24 December: "Friends Give Year Round for Sister Soldiers Overseas"
Douglass Distributing employees transform Christmas tradition into spirited "thank you" to troops"
19 December: "Ice puts freeze on K's travel"
19 December: "Try giving hope for the holidays this year"
17 December: "Project Komets Kare Package"
16 December: "A More Personal, Year-Round Giving Opportunity: Any Soldier® Announces Ten Most Needed Items from Service Men and Women in Iraq and Afghanistan"
16 December: "Soldiers enjoy caring touch "
12 December: "Bus drivers send good cheer, gifts to soldiers in Iraq"
11 December: "Student groups sponsor special events in holiday spirit"
11 December: "State officials to send care packages to U.S. troops"
11 December: "What healthy foods can I send to the troops in Iraq?" 9 December: "A Roundup of Charitable Ideas"
9 December: "Hard Times Holiday Guide"
9 December: "Murad Sends Holiday Gifts to US Troops"
9 December: "Remembering service members at the holidays"
9 December: "Woman makes it her mission to support soldiers in Afghanistan"
9 December: "Please Help American Soldiers in Iraq by Donating Useful Items"
8 December: "Day care kids send gift boxes to the troops"
7 December: "Please Help American Soldiers in Iraq by Donating Useful Items"
5 December: "Soldier’s Christmas family’s passion"
5 December: "No plans? 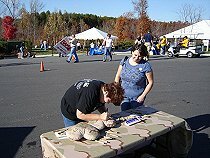 Here are 10 things to do in Rochester area this weekend"
4 December: "Mepham reaches out to soldiers"
2 December: "Holiday cheer for troops"
28 November: "DAR chapter compiles packages for soldiers serving overseas"
25 November: "Local Elves Offer Holiday Support, Surprises For Troops Overseas"
24 November: "New Morgan care package drive successful"
-24 November: "Remember Military Personnel During the Holidays--Everyone Can Make The Holidays Brighter!" 23 November: "SouthernLinc Wireless Partners with Any Soldier Organization"
20 November: "Remember Our Soldiers This Holiday Season"
20 November: "Taking care of our boys"
18 November: "SouthernLINC Wireless Gives a Little "Home" to American Troops ..."
17 November: "Ways to support service personnel"
-14 November: "Our troops face challenges"
13 November: "Shipping center will send letters to military overseas for free"
12 November: "Re-enlisted vet visits Calcutta"
11 November: "Economic Slump, Donations Drop Hits Hard"
10 November: "'Spitz: You don't have to salute"
-10 November: "'Any Soldier' Helps Troops in Harm's Way with Basic Necessities"
10 November: "Couple Raffles Home to Benefit Troops"
8 November: "Woman revives support project for soldiers"
7 November: "Traveling tribute to heroes: Memorial visits Pampa"
5 November: "Other people's business Nov. 5"
-27 October: "Remember soldiers during the holidays"
26 October: "5 tips to keep Halloween sugar rush in check"
20 October: "'Soldier's Christmas' Drive Returns"
17 October: "Make a Difference Day focuses on troops"
17 October: "Children need not view Halloween as a me-first occasion"
15 October: "Online Purchasing History Offers Glimpse Into Goods Preferred by Soldiers"
15 October: "Anyone can help any soldier"
15 October: "Southborough drive aims to give soldiers an autumnal slice of home"
14 October: "Pillowcases provide comfort during time of conflict"
14 October: "Not just any soldier"
9 October: "Anyone can help any soldier"
9 October: "Support the Troops, Win a House"
8 October: "Write to men, women serving in military"
6 October: "Remembering Marines so far from home"
28 September: "House raffle to benefit U.S. soldiers overseas"
15 September: "Get your red shirt ready"
8 September: "Maryland house being raffled to support and benefit U.S. troops"
5 September: "Prince Frederick horse farm has eight acres; raffle tickets sell for $100"
4 September: "$100 Provides Shot at $835,000 Home in Calvert, Benefits Any Soldier"
3 September: "Operation Double Impact blood drive underway"
23 August: "Marlborough woman's care rewarded"
22 August: "Volunteer gives soldiers a taste of home overseas"
22 August: "Blood center asks businesses to hold blood drives"
22 August: "Parade marshal cares for troops"
11 August: "Couple, friend box, zip packages to soldiers"
25 July: "COLUMN: Everybody Calls Me Jana Banana"
22 July: "Second-grader sells toys for troops"
21 July: "Supporting our troops: Goin' Postal promoting patriotism, service to soldiers"
16 July: "Children make cheering deployed their mission"
12 July: "She'll never forget troops in Iraq"
12 July: "Choirs unite for music and a message"
9 July: "Toddlers who care"
9 July: "Family of soldiers reunited on special Independence Day"
3 July: "Operation Booty Beauty sends comforts of home to soldiers abroad"
1 July: "A real patriot act"
27 June: "Operation Beauty Booty"
21 June: "Woman seeks donations for troops"
15 June: "Dealing with distance"
14 June: "Church members send an 'early Christmas' to troops"
14 June: "Groups offer ways to send to troops"
13 June: "Tallahassee woman spends spare time sending care packages to U.S. troops"
11 June: "FYI: Agency sends support to troops overseas"
3 June: "Dalton welcome makes soldier feel 'like a star'"
3 June: "Friends & Neighbors: Anne Moore and Sharon Gray"
3 June: "Letter: Ask Any Soldier"
30 May: "Gift from troops cements lesson in patriotism"
27 May: "Care package effort flourishes"
22 May: "Every School Every Thursday -- Ankeny"
22 May: "Early summer activity ideas"
21 May: "Memorial Day 2008"
21 May: "Heroes Night at Smokies Park"
15 May: "Spitz: Time for a small salute"
3 May: "Operation Boostaroo: How to Give a Soldier a Free Boostaroo"
30 April: "Seniors join troop drive"
29 April: "Organization provides 'quiet comfort' to soldiers"
21 April: "Middle School students to help troops"
17 April: "Baldwin teen group joins effort to help soldiers"
16 April: "Web site brings soldiers and those at home together"
16 April: "Paramount Pictures Celebrates 13th Annual Viacommunity Day"
31 March: "Soldiers show appreciation for support"
31 March: "Well beyond duty's call"
27 March: "Maddox (Jolie-Pitt) makes care packages for the troops"
22 March: "Cedaredge woman honored for sending letters to soldiers"
15 March: "Online connections bring help to the front lines"
-14 March: "Reflections on real life heroes"
14 March: "Area high school students give back to men and women overseas"
5 March: "Island honors 2007 heroes"
3 March: "Unsung Hero: Creating quilts for military a labor of love for area woman"
3 March: "Shelby couple sends supplies to son in Afghanistan for Afghan kids"
28 February: "Woman helping 'Any Soldier' she can"
28 February: "Soldiers await care packages from home"
22 February: "Sharing the Gift of Michael"
22 February: "Club 'Adopts' Servicewomen, Soldiers are sent hair-care products and other goodies"
21 February: "Whitehall seeks items for soldiers"
20 February: "The 8C-750 1963 Texas Farm Tag Connection"
14 February: "O’Fallon Assist-2-Sell Shows Support for U.S. Troops"
13 February: "Campaign surprises; a cause we support"
12 February: "Happy Mail Club touches hearts of troops overseas"
11 February: "Destiny Eadie & "Cards from Destiny" honored by The United Way"
2 February: "At Westview Middle School, Iraq vet looks to change perceptions"
-1 February: "AnySoldier.com supports Wounded Warriors"
24 January: "Civilians Seek To Ease Unique Hardships of Black Female GIs"
22 January: "Packing in the packages"
- 21 January: "Meet our Award Winner"
17 January: "A supply line for 'sister soldiers'"
17 January: "Supporting the troops is a habit for Affton man"
17 January: "HMH-361 Marines play Santa, deliver care packages to brothers at FOBs"
16 January: "Woman, soldier bond through care packages"
15 January: "Students make military pals"
14 January: "CFA Capital Partners 'CFA' Continues History of Community Support by Donating Supplies for Soldiers in Iraq"
11 January: "Sergeant surprises sixth-graders with letter, gifts, certificates of appreciation"
10 January: "`Support the troops' is more than a saying for her"
6 January: "Friends and family celebrate return" Welcome home SPC Lambersky!! 4 January: "Troops could face shorter deployments this time"
EL SEGUNDO, Calif. - December 9, 2008 - This holiday season, Murad, Inc. has teamed with Red Velvet Media to send gifts to US troops via Any Soldier® www.AnySoldier.com, a charitable organization supporting US troops abroad in Iraq. Murad's clinically proven skincare products are being included in care packages designed to help troops protect their skin in the harsh weather conditions of the Middle East. Red Velvet Media chose to respond to the many requests received through Any Soldier for products ranging from books and guitar strings to lip balm. To fulfill the "lip balm" request, Red Velvet Media turned to Murad for the company's expertise in skincare. Murad gifted Age Reform Soothing Skin and Lip Care balms to both male and female soldiers in Iraq to help bring relief to chapped lips and minor skin irritations. Soothing Skin and Lip Care seals in long-lasting moisture while gently soothing and exfoliating. *	BHA's to exfoliate to smooth and revitalize. The Soothing Skin and Lip Care donation was boxed and sent with a variety of other products gathered by Red Velvet Media on December 4, 2008. Murad, Inc. was founded in 1989 by Howard Murad. M.D., one of the world's foremost authorities on skin health and a pioneer of the clinical skincare movement. All Murad products are based on The Science of Cellular Water™, Dr. Murad's unified theory of health and aging. The Murad brand includes 88 consumer products and 45 professional products sold in 45 countries. Murad is the best selling clinical skincare brand at many locations including Sephora and Ulta. Known globally for high performance topical and internal skincare, Murad has grown by producing innovative products that meet the needs of its customers. 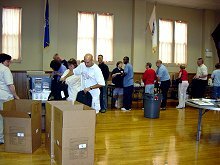 Southeastern regional wireless carrier supports Any Soldier Inc. by sending letters and care packages to soldiers stationed overseas now through Dec. 13. Visit www.southernlinc.com/community for more information about how you can help. 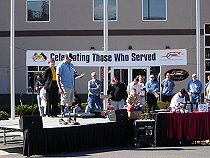 November 8: "Celebrating Those Who Served", a welcome home celebration with special recognition of OIF and OEF combat veterans. 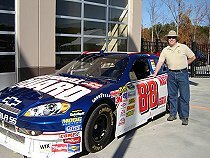 Sponsored by W. G. "Bill" Hefner VA Medical Center & JR Motorsports--Home of the #88 and #5 NASCAR Nationwide Series Teams. Location: JR Motorsports HQ, Mooresville, NC. 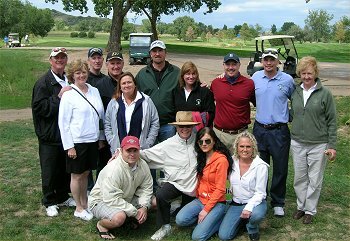 The fourth annual Any Soldier Charity Golf Tournament was held at Cheyenne Shadows Golf Course on Ft Carson, Colorado on September 5, 2008. The tournament is organized by Bob Marsh and his golfing buddies, most of whom are retired service members. A full field of 144 golfers competed in the four person scramble event, which featured mulligans, "Miracle Putts", a hockey hole and a dice hole. A BBQ followed and door prizes were awarded to all players. No one made a Hole-in-One to claim the car provided by Phil Long Hyundai of Chapel Hills. The tournament raised over $8,400 that will provide approximately 575 care packages to the troops overseas. 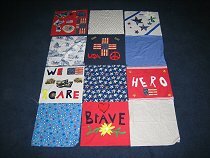 29 August: The quilts handmade by the employees of Takeda at their event in San Diego in June were delivered to the Marines at the Wounded Warrior Battalion - East at Camp Lejeune, NC. Picture taken by SgtMaj Himsworth (who was an Any Marine® contact and now has a son that is a contact). 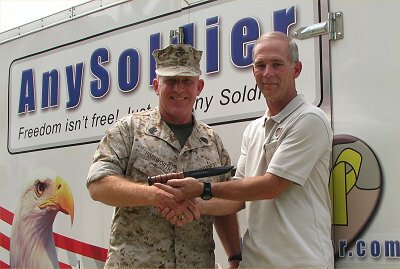 Sergeant Major Ron Himsworth presents an engraved KA-BAR Marine Fighting Knife to Marty Horn, president of Any Soldier Inc. The knife is a gift from the Commander of the Second Marine Expeditionary Force (II MEF), LtGen K. J. Stadler. 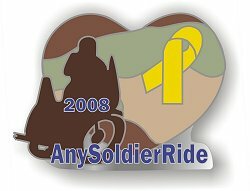 This extreemly high honor is in recognition and thanks to the many supporters of AnySoldier.com/AnyMarine.com. 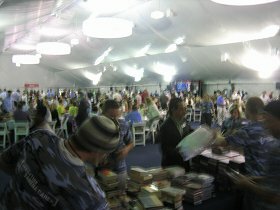 US Navy helping Walter Reed! A living example of Major Bourland's statement that to win we must be "One Team, One Fight". 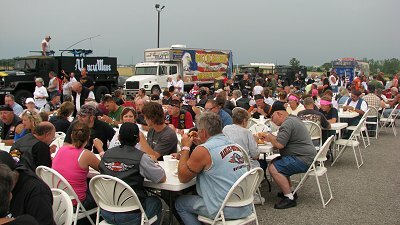 Sponsored by River City Harley-Davidson, Any Soldier Inc. was invited to participate in this great event, "Operation Welcome Home". 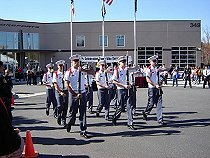 "Auburn, IN - 2008 marks 35 years since America's withdrawal from Vietnam. 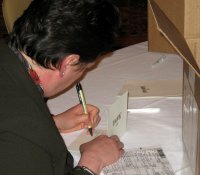 To acknowledge the bittersweet anniversary - and to honor America's GIs, past present and future, several northern Indiana towns are joining with the Kruse Foundation and the American Veterans Institute (AVI) to throw a huge celebration honoring Vietnam veterans...and all who serve." The "Moving Wall" was escorted from the River City showroom to the World War II Victory Museum in Auburn, Indiana. 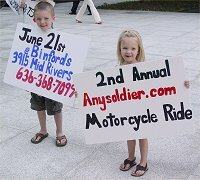 Operation: Quiet Comfort held an event in Jacksonville, NC on Saturday, June 21st. 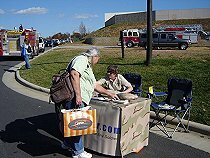 Honor and Comfort: Home Front - Camp Lejeune brought the organization's efforts to help the Wounded Warriors to a Marine Corps community. 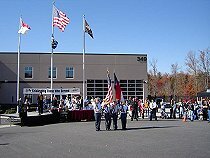 Takeda Pharaceuticals America, Inc. does "Operation: Takeda Cares"
Takeda had some 2,600 of its employees create care packages and quilts for the wounded troops. 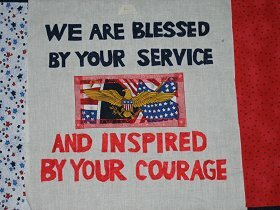 The quilt sections were done by everyone in various patriotic themes and showed an amazing amount of talent and heart. 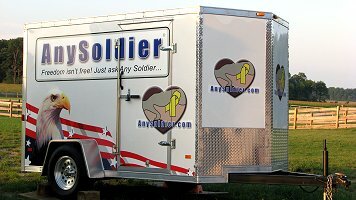 Any Soldier Inc. was invited to attend in San Diego and provided the names of the troops for the care packages and will deliver the quilts to the Wounded Warrior Battaion in Camp Lejeune. 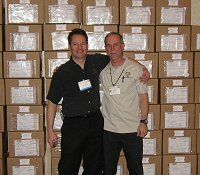 Takeda also made a very generous donation to Any Soldier Inc.
Rolling Thunder XXI, May 25, 2008. Tailgunner video clips HERE, HERE, HERE and Cya! 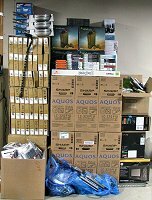 Recently spotted running around the D.C. area...and a lot more... BRING IT!! For the 4th consecutive year, Marriott International invites Any Soldier Inc. to present it's program of supporting the troops to the attendees of the Travel Partners Conference at the stunning JW Marriott Las Vegas Resort, Spa & Golf. 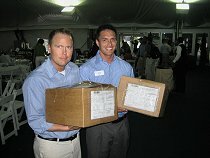 The Marriott supplied all the contents and the Associates and Partners pitched in and created 100 care packages for the troops! Marriott International sets the standard ALL companies should follow. 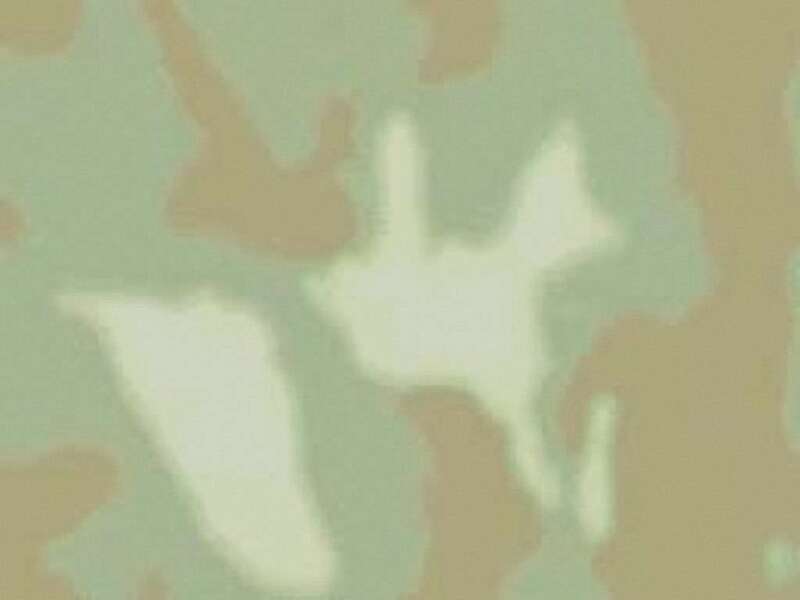 hosted by America Supports You(Sorry, expired link) Program, DoD. 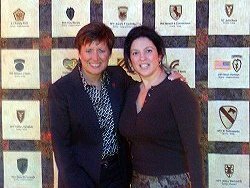 Christina Cicala (R), Any Soldier CFO and Marketing Director with Allison Barber (L), Deputy Assistant Secretary of Defense for Internal Communications and Public Liaison. On the right picture is "Slapshot", the Capitols mascot. 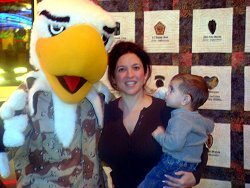 Ms. Barber is responsible for the Department of Defense's communication to the men and women of the military, worldwide, and for community relations programs that link citizens to members of the Armed Forces at home and abroad. 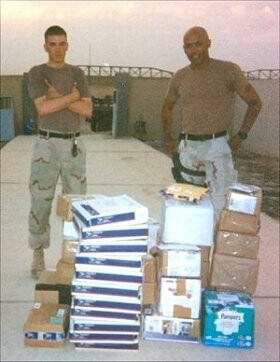 14 Jan 08: Gifts for the Wounded Warrior Battalion at Camp Lejeune. 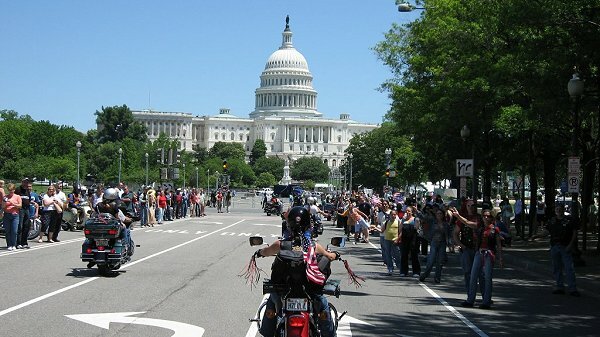 Pictures HERE, and an article from the Marine Corps' "The Globe" HERE.